Rancho Bernardo, CA (RestaurantNews.com) Cowboy Chicken, the Dallas-based rotisserie chain known for its wood-fired chicken and handmade side dishes, is opening its first California restaurant on Monday, June 25. TEXACAL Foods owners and operations partners Kevin Roche and Phil Fontes joined with Cal Capitol Investment Group’s Daniel and Doug Shaffer to bring the growing Cowboy Chicken brand to the Golden State. Roche, an industry veteran and California native, experienced Cowboy Chicken in Texas while at lunch with a friend and instantly fell in love with the great food and the friendly atmosphere. TEXACAL Foods and Cowboy Chicken have signed the largest franchise agreement to date, with 30 Cowboy Chicken locations planned across California. Cowboy Chicken Rancho Bernardo is located at 10562 Craftsman Way in the 4S Commons Shopping Center. The new 2,000-square foot restaurant centers on a large, wood-burning rotisserie where guests can view the chickens roasting from the rustic-meets-modern dining area. The restaurant seats up to 60 and serves lunch and dinner daily from 11 a.m. to 9 p.m. For more information, call 858-674-1981 or visit www.cowboychicken.com. 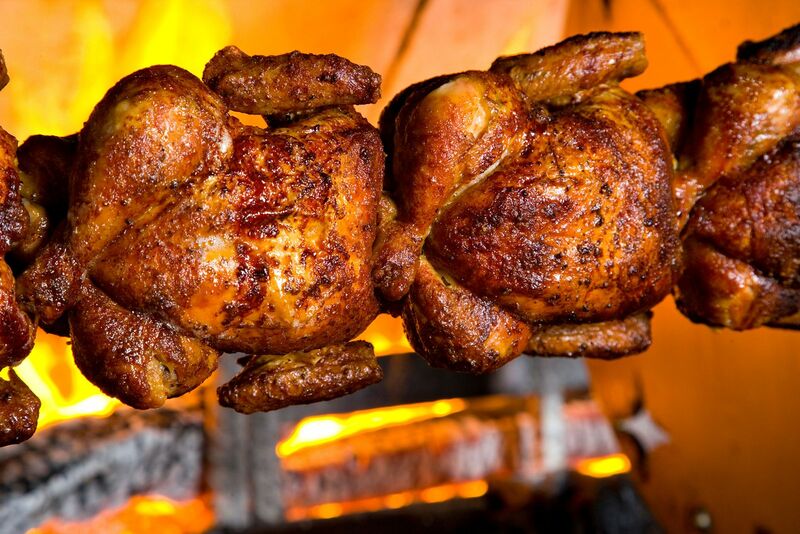 Cowboy Chicken serves all-natural, hormone-free rotisserie chickens that are hand-seasoned in store, marinated for 24 hours and then slowly roasted for two hours over a real wood-burning fire. Other dishes include signature sour cream tomatillo chicken enchiladas, abundant scratch-made sides such as Twice Baked Potaters™, Baked Mac &; Cheese, Ranchero Beans and seasonal cobblers baked in-house daily. Hearty and healthy dishes are available during lunch and dinner for dine-in, take out, catering and delivery. On-the-go diners can order on the Cowboy Chicken app, available through the Apple App Store and Google Play Store, which allows guests to order ahead, pay with their phone at checkout and earn rewards. Founded in Dallas in 1981, Cowboy Chicken is a fast casual restaurant chain specializing in real wood-fired rotisserie chicken. The brand has been included in Fast Casual’s Top 100 Movers & Shakers list every year since 2012. In 2017, Cowboy Chicken was named one of the Future 50 Emerging Chains of the Year by Restaurant Business and one of the Top 25 Most Loved Brands by Foodable. Forbes magazine also chose Cowboy Chicken as one “Hot Restaurant Chain to Buy into Now.” Cowboy Chicken is currently seeking qualified franchise owners to help build the brand in select markets across the U.S. For more information, visit www.cowboychicken.com or contact Kathy Davidson at kdavidson@cowboychicken.com.